For nearly five hundred years (c.1200-c.1690), the walled port town of Cork, built in a swamp and at the lowest crossing point of the River Lee and the tidal area, remained as one of the most fortified and vibrant walled settlements in the expanding British colonial empire. However, economic growth as well as political events in late seventeenth century Ireland, culminating in the Williamite Siege of Cork in 1690, provided the catalyst for large-scale change within the urban area. The walls were allowed to decay and this was to inadvertently alter much of the city’s physical, social and economic character in the ensuing century. By John Rocque’s Map of Cork in 1759, the walls of Cork were just a memory- the medieval plan was now a small part in something larger – larger in terms of population from 20,000 to 73,000 plus in terms of a new townscape. A new urban text emerged with new bridges, streets, quays, residences and warehouses built to intertwine with the natural riverine landscape. The 1759 Map is impressive in its detail. John Rocque (c.1705–62) was a cartographer and engraver of European repute. He could count among his achievements maps of London, Paris, Berlin and Rome. The features that emerge in view on his Cork map are the canals and the links to changing technologies, reclamation, bridge construction, river bank consolidation, creation of quays – all linked to new emerging urban civilisation within a network of canals, reminiscent of Venice, Amsterdam, Copenhagen- Cork’s central canal lined the centre of the newly reclaimed area, admirable buildings on both sides bearing a special relationship with the water. 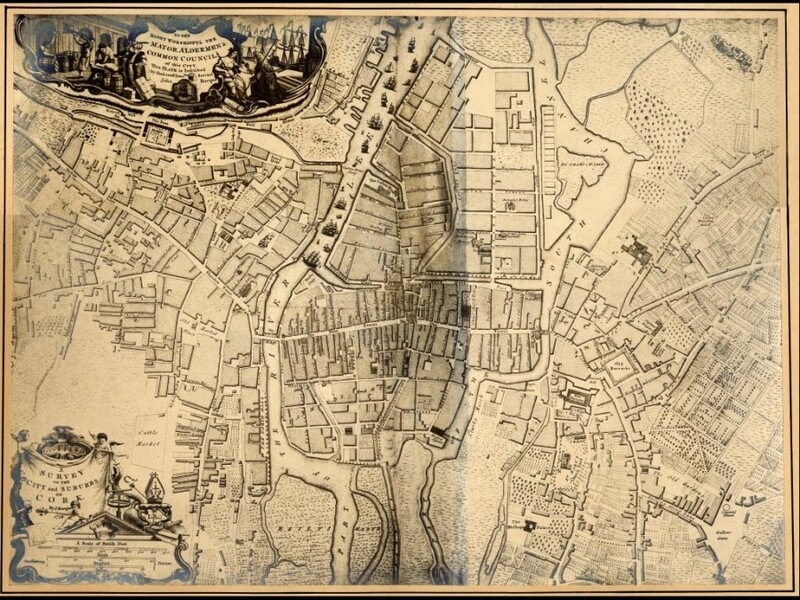 By 1790, many of these were to be filled creating wide and spacious streets like St Patrick’s Street, Grand Parade and the South Mall. One of the more interesting narratives that were created in eighteenth century Cork was its nickname, the Venice of the North. It would be great to point to a myriad of real physical Venetian imagery and perspectives in eighteenth century Cork but this terminology seems only to exist in the legacies of that of that time. Indeed it is more commented upon in nineteenth century antiquarian books and late twentieth century history books of Cork than in the traveloques of eighteenth century antiquarians. Economically, in the eighteenth century, the city was booming. By 1730, the population had increased to 56,000, by 1790, the population of the urban area was 73,000. This was a large increase since a population of 20,000, one hundred years previously in 1690. The settlement’s reliance on the harbour and hinterland maintained a lucrative provision trade. Cork comprised on average forty per cent of the total export from Ireland with just over seventy per cent of this total sent to the European mainland. The list of countries included; Denmark, Norway, Sweden, France, Germany, Great Britain including the coastal islands, Holland, Italy, Portugal, Spain, Barbadoes, Turkey and Greenland. Cork held eighty per cent of the Irish export to Englands’ American colonies. The main ports include Carolina, Hudson, Jamaica, Montreal, Quebec, New England, New Foundland, New York, Nova Scotia, Pennsylvania, Virginia, Maryland and the West Indies. Exports were also sent to New Zealand and the Canaries. By 1800, Cork was reputed to be the most note-worthy transatlantic port.